BBC Newsnight (the main news & current affairs program on the BBC). 2015. (http://www.bbc.co.uk/programmes/b05yww9x) Access only in the United Kingdom. Holland, Jesse. 2015. “Choosing Your Own: Definition of Race Becoming Fluid.” Associated Press. (http://hosted.ap.org/dynamic/stories/U/US_NAACP_LEADER_RACIAL_QUESTIONS_IDENTITY) Reprinted in places such as: ABC News.com, US News & World Report, Salon, The Washington Post, Minneapolis Star Tribune, Richmond Times Dispatch, Washington Sun Herald, Knoxnews, New Zealand Herald, Seattle Times. Several scholars claim that group cohesion among black Americans is necessary for black advancement. Our research examines the extent to which group cohesion is possible given the increasing diversity of Black America, particularly with regard to race and class. Drawing on in-depth interviews with 33 middle-class blacks and 40 black-white biracials, we explore (1) the similarities and differences in the experiences of both groups, (2) their encounters with marginalization, (3) how they negotiate perceived marginalization, and (4) the extent to which all of the above are shaped by socially constructed ideas of blackness. We find that narrow notions of “authentic” blackness challenge group cohesion and threaten to splinter the black community along class and ethnic/racial lines. However, we find evidence of greater tolerance for the community’s racial diversity than its class diversity. Nevertheless, the data presented here suggest that the increasing heterogeneity of Black America poses significant challenges to group cohesion. This study adds to the growing body of literature on multiracial identity by illustrating the importance of reflected appraisals in shaping racial identity. Importantly, these findings also show how reflected appraisals are fundamentally shaped by the one-drop rule (for black-white Americans in particular). Few studies examine reflected appraisals as a determinant of racial identity (Khanna 2004), and I find that biracial respondents frequently explain their black identities as due, in part, to how they believe they are viewed by “others” and by “larger society.” As suggested by Brunsma and Rockquemore (2001), however, who argue that how biracial people think others view them is moderated by social context, many respondents draw distinctions between how they believe they are perceived depending upon whether the observers are white or black. Other white people, they argue, see them as black, while other black people are more likely to recognize their multiracial backgrounds. These conflicting perceptions have the potential to shape different “racial reflections” (e.g., as black or multiracial), yet I find that the one-drop rule affects the entire reflected appraisal process, subsequently shaping “internalized” black identities for the majority of respondents. Nikki Khanna, “‘If You’re Half Black, You’re Just Black’: Reflected Appraisals and the Persistence of the One-Drop Rule,” Sociological Quarterly, Volume 51, Issue 1 (Winter 2010). 113-114. http://dx.doi.org/10.1111/j.1533-8525.2009.01162.x. I propose that the one drop rule no longer trumps physical appearance, but nonetheless it continues to influence racial identity today. I propose that the one drop rule no longer trumps physical appearance, but nonetheless it continues to influence racial identity today. In particular, the one drop rule affects how black-white biracials’ physical appearances are perceived by others. Despite the range in their physical appearances (e.g., some have dark and others light skin), black-white biracial Americans are frequently raced as black. This is because the legacy of the one drop rule has shaped how Americans (of all racial and ethnic backgrounds) perceive normative “black” phenotypes. According to Russell, Wilson, and Hall (1992), black Americans show a “kaleidoscope of skin tones” (9), due both to the long history of interracial mixing between blacks and whites and to the broad definition of “blackness.” Under the one drop rule, individuals with any degree of black ancestry were classified as black; thus, the normative phenotypic image of a “black” person became broad, and we can see today that black phenotypes vary widely in skin tone and other physical characteristics (e.g., nose shape, hair texture). Even today, having some “white” phenotypic characteristics—such as light skin, blue eyes, and straight hair—does not necessarily conflict with Americans’ image of blackness. For example, actress Vanessa Williams and recording artist Beyoncé Knowles are both “black” with some degree of white ancestry and “white” features. While Williams and Knowles do not outwardly appear white (i.e., they could not pass as white), they do have some physical features that reflect their white ancestry; Vanessa Williams has light skin and blue eyes, and Beyonce Knowles has light skin and long, straight hair. Having these “white” normative physical characteristics, however, does not necessarily conflict with Americans’ image of what it looks like to be black. This broad image of blackness not only influences how Americans view blacks, but also how they view biracial black-white Americans. Regardless of any “white” physical characteristics biracial individuals may have, others tend simply to classify them as black because their perceptions of what a “black” person looks like do not preclude normative “white” physical characteristics. For instance, a biracial person may have straight, long hair, but so do many black Americans (either because of white ancestry or because of hair straightening/“relaxing” techniques common among black women today). As a consequence, many Americans are unable to distinguish between black and biracial phenotypes. Thus, appraisals of these phenotypes (both real and reflected) are influenced by the historical legacy of the one drop rule, which continues to shape black identities even today. Comments Off on I propose that the one drop rule no longer trumps physical appearance, but nonetheless it continues to influence racial identity today. This guide accompanies the following article: Nikki Khanna, ‘Multiracial Americans: Racial Identity Choices and Implications for the Collection of Race Data’, Sociology Compass 6/4 (2012): 316–331, 10.1111/j.1751-9020.2011.00454.x. In 2010, approximately nine million Americans self-identified with two or more races on the United States Census – a 32 percent increase in the last decade. President Barack Obama, the son of a white Kansas-born mother and Kenyan father, was not one of these self-identified multiracial Americans. In fact, Obama chose only to check the ‘black’ box, illustrating that multiracial ancestry does not always translate to multiracial identity. Since the 1990s, there has been a growing body of research examining the multiracial population and key questions have included: How do multiracial Americans identify themselves? And why? This paper reviews this research, with a focus on the factors shaping racial identity and the implications regarding the collection of race data in the US Census. Khanna, Nikki. 2011. Biracial in America: Forming and Performing Race. Lanham, MD: Lexington Books. This website explores the common misconceptions about race through several interactive activities. This website explores the question ‘What is Race?’ through several interactive activities. Read the (entire?) guide here. Elected in 2008, Barack Obama made history as the first African American President of the United States. Though recognized as the son of his white Kansas-born mother and his Kenyan father, the media and public have nonetheless pigeonholed him as black, and he too self-identifies as such. Obama’s experiences as a biracial American with black and white ancestry, although compelling because of his celebrity, however, is not unique and raises several questions about the growing number of black-white biracial Americans today: How are they perceived by others with regard to race? How do they tend to identify? And why? Taking a social psychological approach, this book identifies influencing factors and several underlying processes shaping racial identity. 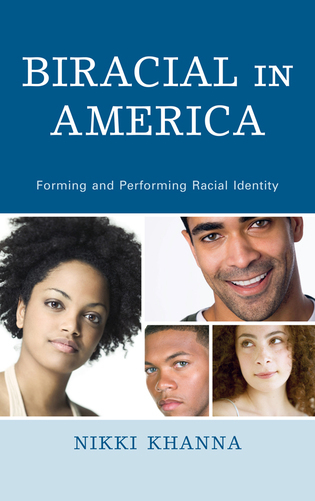 Unlike previous studies which examine racial identity as if it was a one-dimensional concept, this book examines two dimensions of identity—a public dimension (how they identify themselves to others) and an internalized dimension (how they see themselves internally)—noting that both types of identity may not mesh, and in fact, they may be quite different from one another. Moreover, this study investigates the ways in which biracial Americans perform race in their day-to-day lives. One’s race isn’t simply something that others prescribe onto the individual, but something that individuals “do.” The strategies and motivations for performing black, white, and biracial identities are explored. Despite growing interest in multiracial identity, much of the research remains atheoretical and limited in its approach to measuring identity. Taking a multidimensional approach to identity and drawing on reflected appraisals (how they think others see them), I examine racial identity among black-white adults in the South and the lingering influence of the one-drop rule. Most respondents internally identify as black and when asked to explain these black identities, they describe how both blacks and whites see them as black. I argue that the one-drop rule still shapes racial identity, namely through the process of reflected appraisals. …To address this gap in the literature, I draw on interview data with 40 black-white biracial adults currently living in the South and examine how reflected appraisals shape their racial identities. Because I am looking at racial identity among people with black ancestry, I also look at how the one-drop rule influences the reflected appraisal process (and hence identity). Few studies seriously engage reflected appraisals as a determinant of racial identity, and none examine the way in which the one-drop rule affects reflected appraisals. Additionally, I interview black-white biracial people who are currently living in the South for two reasons. First, the one-drop rule is historically rooted in Southern slavery and the Jim Crow segregation in the South, and recent empirical research suggests that the one-drop rule continues to shape black identities in the South (Harris and Sim 2002; Brunsma 2005, 2006). Second, little attention has been given to this region in previous studies. While quantitative studies suggest that the one-drop rule still impacts identity in the South, little qualitative work examines black-white identity within this context (see Rockquemore and Brunsma 2002a for an exception)….